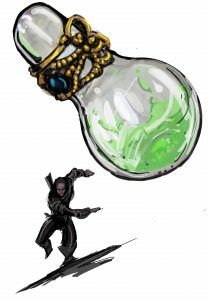 To celebrate the release of the Complete Advanced Feats, here is a brand-new feat inspired by one of the classes in the Pathfinder RPG Advanced Players Guide. Complete Advanced Feats features 180 feats for Pathfinder RPG, 18 detailed character builds, class breakdowns, and extra goodies like an eidolon character sheet. It’s the perfect companion to the Advanced Players Guide. Great article. Thanks for providing the feat workshop! Nice to see how this was conceived and then executed, taking the mechanics into consideration and applying your idea to them accordingly. Magical ranged weapons confer their magic abilities onto their ammunition. Does that apply here? How? You would get the enhancement bonus from the sling on the attack roll, but it would not apply to damage, nor would other weapon properties that affect damage. At least that’s the way I wrote it up. Applying damage wouldn’t make much sense with a number of flask type items which don’t normally deal damage on impact so I avoided trying to make weapon properties apply in the feat.